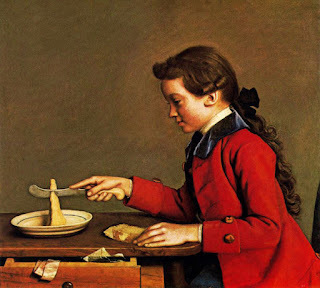 Jean-Etienne Liotards pictures, including an interesting one of a boy cutting a piece off a butter cone, highlight an interesting 1803 breakfast description. A cup of chocolate (followed by a glass of water), tea (with lumps of sugar and cream which is cold), coffee (better with hot cream) rolls and toast (with butter and salt) made a perfect breakfast for ten year old Lucy in the book Conversations d'une mère avec sa fille. (Conversations of a mother with her daughter) by J. Franceschini. Paris: 1803. excerpts below. 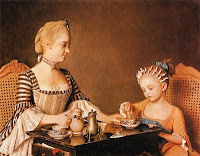 In a previous posting on Jean-Etienne Liotard’s (1702-1789) chocolate themed watercolors, HERE chocolate served in a cup with a glass of water on the side was drawn in a couple of his paintings. 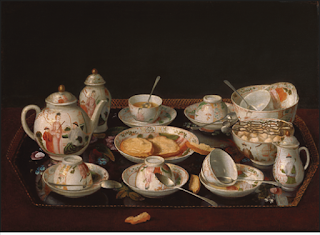 Some of his breakfast and tea pictures – including a fabulous one of his son slicing butter from a cone of butter c1769 – will be interspersed with the following breakfast conversation. 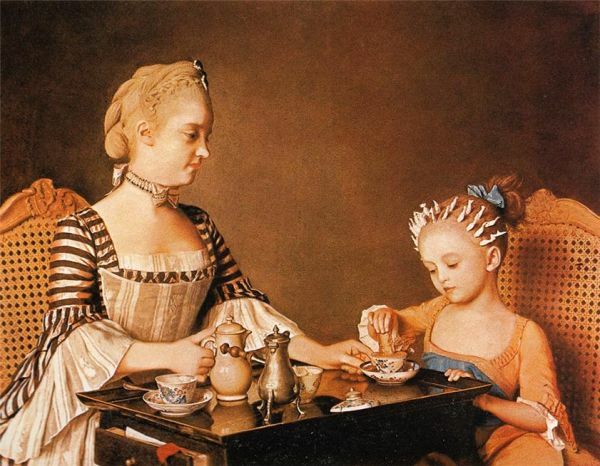 And I just had to include the wonderful daughter and Mrs. Liotard picture again… click for larger images. Mrs. MELVILLE. Is my breakfast ready? M O L L Y. It has been ready some time, ma'am, the water boils for the tea; the coffee and chocolate, are also before the fire, you may therefore choose. Mrs. MELVILLE. Sit down, Lucy, and take that napkin. Bring me the tea-chest. M O L L Y. Here it is, ma'am: will you have the tea-pot? Mrs. MELVILLE. Yes, go and fetch me the kettle. L U C Y. Do you only take tea, mamma? I have so good an appetite that I should prefer chocolate, if you will give me leave. L U C Y. May I eat some toast? Mrs. MELVILLE. Just as you please, here are some rolls. Lucy, give me the sugar-bason and the sugar-tongs. L U C Y. Will you have a teaspoon? Mrs. MELVILLE. Certainly; I wish also for some butter and a salt-cellar; I do not like my bread and butter without salt. Hot cream is only good with coffee, and I do not see any cold, which is better with tea. M O L L Y. Here it is, ma'am, in this china milk-pot. Mrs. MELVILLE. Ah! It is true. Give me a knife. L U C Y. Mamma, will you permit me to drink a glass of fresh water after my chocolate? I am very thirsty. Mrs. MELVILLE. There is no danger now, but there would have been at our return from walking, for you were then very hot. L U C Y. And if I were now to take a cup of tea, would it hurt me? Mrs. MELVILLE. No certainly; at your age breakfast is one of the best meals. Take that cup, and do not pour your tea into the saucer. L U C Y. Will you give me sugar, mamma? Mrs. MELVILLE. How many lumps? L U C Y. Three or four, I like my tea very sweet. Mrs. MELVILLE. Stir it well with your spoon, or else you will have a thick sirup at the bottom of the cup. L U C Y. Mamma, when we have gentlemen, to breakfast, and particularly huntsmen, I am very uncomfortable. Mrs. MELVILLE. And why so? L U C Y. Because they eat meatpies or ham, and drink wine, the smell of which, is very disagreeable to me in the morning. Mrs. MELVILLE. In society, we must know how to bear those little inconveniences without murmuring ; and to be esteemed in it, we must endeavour to live continually for others. L U C Y. I am convinced of it, but still I like our little, neat and quiet breakfast much better.